Soar through the dry desert and enjoy the wonders of the tiki masks. Landing six or more of them will lead you into a massive win! 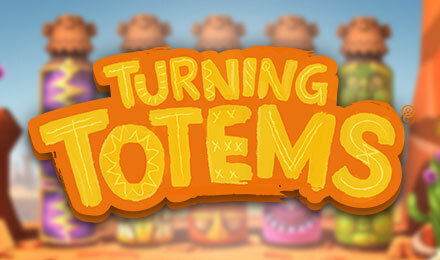 In Turning Totems slots you’ll find yourself in the middle of the American desert with five tall totem poles. In the colourful air of the game, you’ll see that the totems have different coloured tiki masks embedded on them. You will soon discover that the reels don’t roll but rotate. To attain a win, you will need to land a minimum of six of the same symbols anywhere on the totems. The largest payouts happen when at least 15 of the same symbols are landed. Benefit from the Free Spins feature where you can win 1,204x your stake for landing 15 of the pink masks.